This sauce is fantastic! 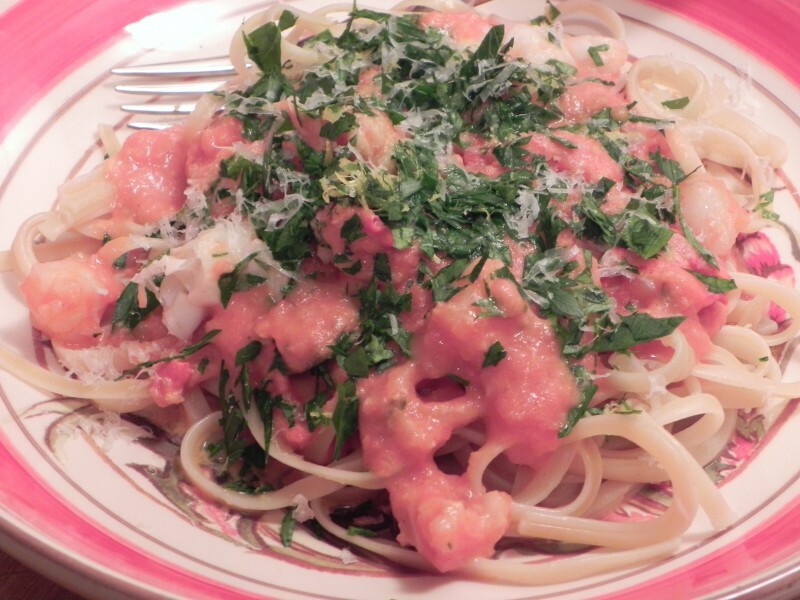 The richness of the lobster and tomatoes is complemented by the light flavor of the fresh parsley and lemon zest. Once you get the hang of this recipe, it will become a go-to choice for impressing friends and family at a dinner party. Special Equipment: Immersion blender or a regular blender. Steam or boil lobsters for 6 minutes. Cool to room temperature under running water. Separate claws and tails from lobster heads. Remove tail meat from shell. Pull away black vein and discard, then cut meat into 1/2-inch slices and set aside. Crack claws with mallet, without removing meat, and set aside. With a large knife, split lobster heads in half lengthwise. Remove and discard stomach sacks located just behind eyes (remove green tomalley also if you wish) and roughly chop tail shell. Heat butter in a wide saucepan or skillet over medium high heat. Add heads and shells, with any collected juices, and sauté for about 1 minute. Add carrot, celery, bay leaf and thyme and cook, stirring, for 1 minute more. Add 3 seafood stock and 1/2 cup white wine and simmer rapidly for about 10 minutes to reduce by half. Strain, discarding shells, herbs and vegetables. You should yield 1 1/2 cups rich lobster broth. Wipe pan with paper towel and return to stovetop over medium-high heat. Warm the olive oil, then add diced onion, garlic and hot pepper flakes. Season generously with salt and pepper. Cook, stirring, until onions are completely soft, about 10 to 15 minutes. Take care not to let onion mixture brown. Add wine and simmer rapidly for 2 minutes, then add tomato purée and lobster broth. Simmer for 5 minutes, then add cream and simmer until sauce has thickened somewhat, about 5 minutes more. Turn off heat and use immersion blender to puree the sauce. Do this carefully, tilting the pan so that the sauce fully covers the blade of the blender, so that the sauce does not shoot all over the place! (Note: if you don’t have an immersion blender, let the sauce cool slightly and then pour it into a blener to puree) Sauce can be done up to this point several hours in advance of cooking pasta. Bring a large pot of well-salted water to a boil. Add pasta and cook until al dente. Reheat sauce, add cracked lobster claws and simmer for 2 minutes. Add sliced lobster meat and cook for a minute or less, until just heated through. Mix parsley and lemon zest together. Drain pasta and add to sauce, tossing to coat noodles and distribute lobster meat, then transfer to a warm bowl or platter. Arrange one claw on top of each serving and sprinkle with parsley mixture and freshly grated Parmigiano Reggiano.